26 Feburary 2016 (London) -- Chinese Commerce Minister Gao Hucheng said that China and Britain face a rare opportunity in promoting bilateral economic and trade cooperation, according to a press release by the ministry. 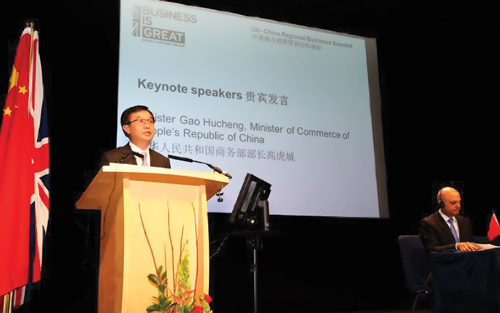 Speaking at the 12th conference of the China-UK Joint Economic and Trade Commission in Birmingham, Gao said that the joint efforts of two countries have given rise to a pattern of mutually beneficial, overall, sweeping and multi-level cooperation in economy and trade. The launch of China's 13th five-year plan and the ushering of "Golden Era" of China-UK relations as well as economic structural reforms and sustainable development pursued by both governments provide rare opportunities for bilateral economic and trade cooperation, he said. Gao proposed that two countries should connect economic strategies, tap trade potential and expand service trade. He also expressed the hope that Britain will play a leading role in the European Union to facilitate the early signing of China-European investment agreement and feasibility study of China-European free trade zone. Also Speaking at the conference, Sajid Javid, British Secretary of State for Business, Innovation and Skills, said that since the successful visit to Britain by Chinese President Xi Jinping in October last year, Britain's desire to cooperate with China has been stronger than ever. The British government is willing to promote pragmatic cooperation between businesses of the two countries and continued growth in bilateral trade and investment, Javid said. A China-UK municipal trade and investment forum was held on the sidelines of the conference, which led to the signing of 10 accords of cooperation involving fields such as finance, food, auto parts and medicine.